Becky wanted a tutorial on how to make a lovely little Pleated Bag like this one. So here it is to share with you all. Let me know if you make one, I'd love to see it! Warning: There are lots of pictures. I'm not experienced in writing tutorials so please let me know if something is confusing or wrong. 8 in. tall, 12 in. wide across the bottom, and 4 in. deep. note: If you are using Decorator weight fabric you will not need medium weight interfacing. My lining fabric is 100% quilt weight cotton, and the brown fabric is a very thin polyester type. 18 in. square of main fabric and medium weight interfacing. 8" X 9" pocket fabric. Take the main fabric square and pin or baste it to the med-weight interfacing. From here on out treat these pieces as one. Make the Pleats on two opposite sides of the square. 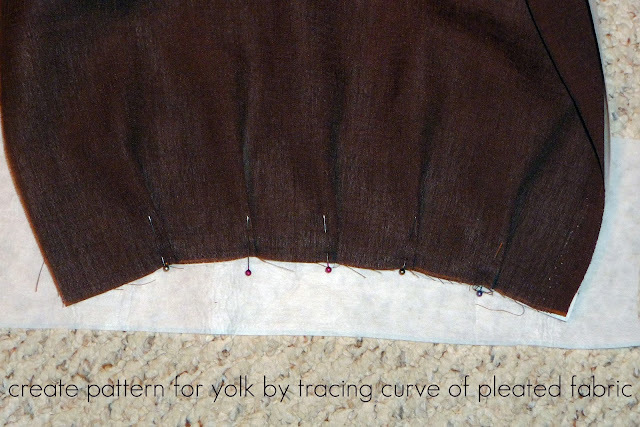 Once you have two rows of pleats, use one of them to make a pattern for the yolk of the bag. To make the pattern, lay the pleated edge on a large piece of paper and trace the curve. Use a ruler to mark another line 3 inches away, and then connect the dots. Cut out the shape and fold it in half to make sure it is equal on each side. 2 from fleece or batting. Pin the interfacing to the coordinating fabric and pin yolk to pleated square. Now to make the lining iron the Fusible Fleece to lining fabric (I used batting 'cause I ran out of the fleece) and pleat the square and ad the yolk as before. Sew on pocket by topstitching 1/8 inch from the edges. Next put in your magnetic clasp. Find the center and mark 1-1/2 in down from top. The stabilizing plastic I used here was a disc cut from Ikea shelf liner, but plastic from the side of a milk jug works well too. And there's a lovely Pleated Bag for you to use or to send to a favorite friend. It would make a great Christmas gift! Enjoy! Sarah, it looks great!! Thank you so much for taking this on for me. :D I have a hard time critiquing a tutorial until I actually work my way through it. I hope to find some time for it soon, and I can tell you how it went, and share my results with you. :) Thanks again, a million times!!! What a gorgeous bag! Thanks so much for sharing, this is going straight on my to do list! Thank you so much for the tutorial! Visiting from Boy oh Boy oh Boy. Hope you'll visit me sometime at www.superstinkyboys.blogspot.com! this is so cute! thanks for sharing - going on my TO DO LIST someday. Your tutorial is great! It is not easy to create pictures that are easy to follow and understand even without reading! Hi Sarah, your tutorial is absolute great! Made this bag - my first one with pleats and it turned out to be gorgeous though I changed a few steps!!! Thanks so much - wish I could post you a pic for your opinion! Keep on posting tutorials - they are great!!! My favorite part of the bag is the handle and I'm so happy with all the instructions. I've made only two bags but the instructions are not as nice as yours. Thank you for sharing your pattern with us. It is so pretty! What a great purse and tutorial. 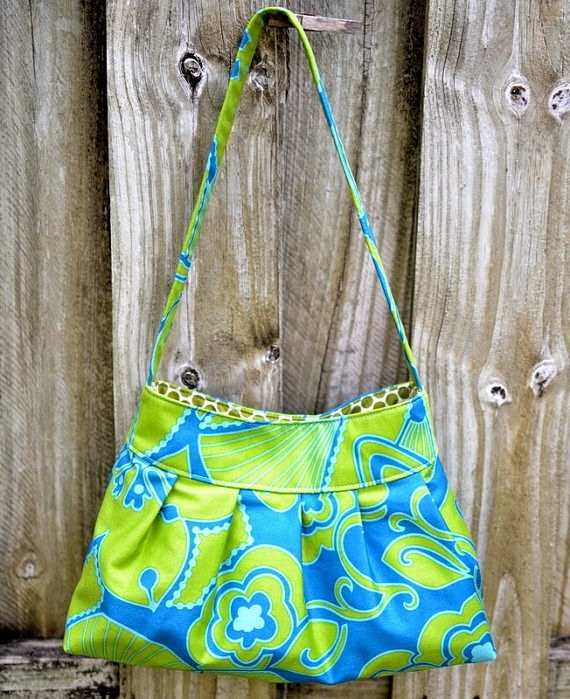 I a bit addicted to making bags myself.. found you on Creative Headquarters blog hop! Delightful pleated bags. Excellent tutorial. I can't wait to make these. Your tutorial definitely goes into my list of favorite tutorials. Great job. I'll use some of my dress fabrics in doing this. Working on one now. Thank you very much, this has been so helpful. The stabilizing plastic I am using is being cut from a disposable chopping mat that I got from the dollar store. I also use them when I need to cut a template for quilting. That's a great idea to use a chopping mat. Glad the tutorial is helpful. It was the first one ever wrote, Lol! I'd love to see it when you're done. I like this one as much as the Buttercup pleated one.